Progressives want another hanging,… and soon! This is the ad that ran yesterday by Velvet Revolution. Progressives placed ads in Washington and Crawford, Texas(?) newspapers yesterday equating President George W. Bush with Saddam Hussein, the Butcher of Baghdad. 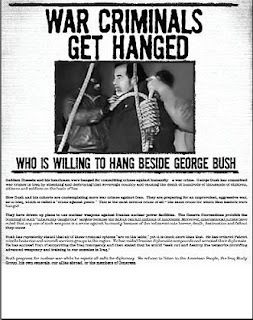 Saddam Hussein and his henchmen were hanged for committing crimes against humanity – a war crime. George Bush has committed war crimes in Iraq by attacking and destroying that sovereign country and causing the death of hundreds of thousands of children, citizens and soldiers on the basis of lies. Now Bush and his cronies are preparing for more war crimes, this time against Iran — an unprovoked, aggressive war, as in Iraq, which is called a “crime against peace.” This is the most serious crime of all – the same crime for which Nazi leaders were hanged. They have drawn up plans to use nuclear weapons against Iranian nuclear power facilities. The Geneva Conventions prohibit the bombing of such “inherently dangerous” targets because the fallout can kill millions of innocents. Moreover, international jurists have ruled that the use of such weapons is a crime against humanity because of the indiscriminate horror, death, destruction and fallout they cause. Bush prepares for nuclear war while he rejects all calls for diplomacy. He refuses to listen to the American people, members of Congress, the Iraq Study Group, his own generals and intelligence officials, or our allies abroad. In the Cuban Missile Crisis, President Kennedy confronted a real and imminent threat, defused it and preserved the peace and the strength of America. Now Bush concocts a false and distant threat, rejects rationality and fans the flames of nuclear war. Congress Members and Military Generals, if you don’t act to stop Bush’s dangerous and reckless conduct, you will be accomplices to war crimes. History will judge you harshly. You cannot wait. Bush can use any incident as a pretext to attack Iran. You must follow the Watergate precedent when Republican leaders went to the White House and demanded that Nixon resign. Tell Bush that the jig is up and that he and his cronies must resign immediately or face criminal prosecution. Did Bush say he was going to nuke Iran? I must have missed that… If anything, the US would most likely resort to the old-fashioned Wesley Clark carpet bombing tactic. Unless of course, those members of the Mossad and CIA are able to work their wonders. Did you happen to notice from the twisted ad, that these “progressives” believe Iran over the US?